Passeie a cavalo por um refúgio natural perto de Barcelona em uma excursão privada de 5 horas, perfeitamente adaptada aos seus interesses e nível de habilidade. Encontre seu cavalo e guia experiente e explore o parque; caminhe, trote ou galopar por trilhas cênicas com vista para o campo catalão. Escolha uma rota excitante e um ritmo acelerado, ou opte por um passeio calmo e relaxante que deixa bastante tempo para apreciar o belo cenário do parque. Termine o seu passeio com uma refeição ligeira de especialidades catalãs e espanholas antes de regressar a Barcelona. This was so much fun. Our guide picked us up right from our hotel, and was so friendly our entire drive. The horseback riding was a wonderful experience, even though I was super nervous. We went up and down the trail through the mountains and it was beautiful even though it was a rainy day. The only annoying part was that there were dirt bikes that would scare the horses a bit. After we returned, our guide had set up a sweet little tapas lunch with wine and surprised us with champagne since it was our honeymoon. Not only was the day just perfect, our guide was so friendly and you could tell how much he loved his job. Highly recommend using this company for any of their trips. Excellent ride along the beautiful scenery of Barcelona. Great horse...Arabian mare! All horses in great condition. Nice balance of trotting, cantering and a few gallops, too! Nice tapas lunch provided and very friendly and competent staff. 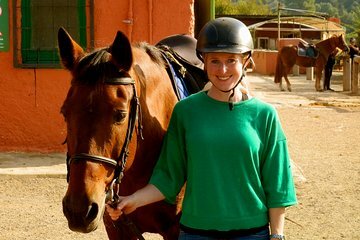 We decided to book a private horse riding experience in the natural park near Barcelona. It was great. We have ridden horses on holiday all over the word in the USA, Cuba, DomRep, Scotland, Australia. However, there was something special about this experience in particular. The day started with my partner and myself being picked up at 9am outside our hotel. We spent the entire 40 minute journey to and from the ranch chatting with the ever so friendly Alex who undoubtedly has a real passion for what he does. Alex looked after us throughout the day and couldnt have done a better job. What was special about this experience is that the rider gets to bond with the horse before riding off on a trek. It was lovely to get to lead the horses down from the paddock, brush them and help tack them. We spend a little time in the horse ring getting to know how to ride the horses. It was a lot of fun! The horses were well looked after and we got to shower them down after the trek. Alex also showed us around the ranch so we could meet some of the other horses. The trek itself was through the beautiful forest and tailored to the capabilities of the rider we are both rusty but fairly experienced riders and got to do lots of trotting and cantering. The day was finished with a lovely lunch and a little red wine. It was nice of Alex to take pictures of us and send them via dropbox! Truly a wonderful experience.